Lake Freighter or Laker, originally uploaded by Scott Thomas Photography. 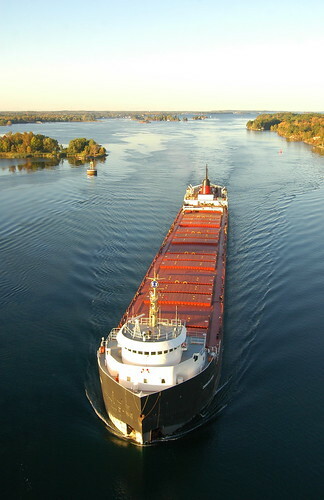 The Laker Canadian Leader before going under the 1000 Island Bridge on the St. Lawrence River near Clayton, New York. This ship is similar to the famous SS Edmund Fitzgerald that sank on Lake Superior on November 10, 1975. The mishap which is chronicled in Gordon Lightfoot’s hit song, The Wreck of the Edmund Fitzgerald, helped make the incident the most famous disaster in the history of Great Lakes shipping. I rented a Tokina 12-24mm f/4 wide angle lens for a weekend trip to the 1000 Islands in New York state back in 2007. This was the first time I walked to the top of the 1000 Islands bridge. Remember the last time? This entry was posted in Travel and tagged 1000 islands, bridge, edmund fitzgerald, freighter, gordon lightfoot, laker, new york, nikon, river, ship, st. lawrence, tokina 12-14mm, uwa, water, wide angle. Bookmark the permalink. Whoa! I was sitting here awestruck admiring that first freighter–amazed that you could make a freighter look THAT GOOD–remembering my own challenges shooting a freighter in Duluth–and then read on to the dedication. A hug this morning to you, Scott, thank you! By the way, my husband is in a little local band and whenever they play the “Wreck of the Edmund Fitzgerald” the whole place gets quiet, reverential. It’s a powerful song. So glad you commented on this early, Kathy. I have been without Internet at work the last few days and have not gotten around to all my favorite blogs much this week. It paid off to get up early and be at the top of the bridge just as this Laker was coming into view. The early morning light and the colorful ship combined for a beautiful image. The ship immediately brought the Wreck of the Edmund Fitzgerald to my mind and, after meeting you via your blog, yourself. Hugs back to you! What a great shot! Light, composition are dead on and pleasing to the eye. Thanks, Mike! I love the St. Lawrence River. Spent many summers camping up there with my family. Excellent shot, Scott! The ship is awesome and the photo makes it look even better! I know you have your mountains, Terry, but I can not imagine not living near the natural wonders which surround New York. The St. Lawrence River being one of them. Scott, it’s a beautiful shot. The lighting is perfect and looks so calm and peaceful. I bet not many people feel that way about a photo of a big freighter. I do agree with you. As big as they are, the engine noise is not very loud and the ships seem to pass magically by. Love the shot of the freighter, Scott! Great composition, great angle and I love the ripples in the water. Thanks, Cindy! I was lucky in that there was little boat traffic when the Laker came by. I followed you here from Amy-Lynn’s blog and I’m glad I did! That is a really wonderful image – the light is truly lovely, and as Kathy said above, you’ve made the freighter look “THAT GOOD”. Wonderful to hear the song again. It is such a moving tune. Welcome, Mrs. K! You have a nice triad of blogs.